Being a writer is a matter of writing everyday, no matter what the subject matter. That's the lesson that I have found it hardest to learn, but it's the most important one. There was a huge part of me, when I graduated from Tulane University with a Bachelor's in English and a concentration in Creative Writing, that wanted to go on to get my MFA. My writing professor and mentor, Paula Morris, had put my eye on the University of Iowa, and I placed it atop a pedestal. The University of Iowa became my dream school, and I planned to go there—right after I finished my year or two of teaching math in New York City. The 2008 Recession toppled that house of cards. What I built after that was made of grittier stuff. “Exactly.” She swung the towel around her neck and walked into the observation bay. Overhead, Alyssa could see distant stars standing perfectly still, belying the fact that the colony ship Xinsheng was traveling at a little over 250,000 kilometers per second. A drop of sweat stung Alyssa’s eye. “How much do I have to eat in that time to survive?” She wiped her forehead and let her hand slide over her buzz cut, her sweat aerosolizing as the brown hairs snapped back. It would eventually become vapor, travel through the filtration system, and return to her as drinking water. One less thing to worry about. One less is all she could ask. “Yeah.” Alyssa thought about how fast she would have to run to break through the glass in the observation bay. Too fast was the answer. She’d have to throw herself at one of the panes at supersonic speed. She’d die, sure, but much of the ship would be vaporized with her. Alyssa’s heart sank into her growling stomach. She had to drink water now. And she had to eat soon. The shifts before her—before the Xinsheng crossed the Einstein-Rosen bridge, carrying it over twenty light years from Earth—had all enjoyed access to the hydroponics bay. She’d awoken from stasis to find every plant in the hydroponics bay desiccated. Every seed irradiated. Colonel Rahmani, her superior officer, had been on duty. When Herod had awoken her, Rahmani been missing for two days—along with the logs and sensor data for that period of time. The colony would be fine—their food was stored with other genetic samples within locked compartments in the stasis deck. Alyssa, and anyone who Herod woke up after her, would starve without a new source of food. And there’d only been one viable source of food left on the ship. As a volunteer, Alyssa had sworn to protect her crew. She had failed. Even if she succeeded in leading them to their new home, she knew she couldn’t stay with them. Not now. Not after what she’d done. 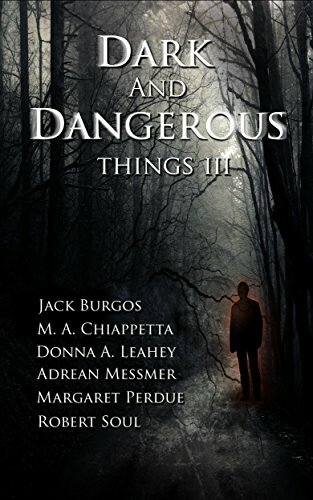 Read "Xinsheng" today by purchasing Dark and Dangerous Things III on paperback or Amazon Kindle. The Oklahoma Writers' Federation (OWFI) had its annual writers' conference on May 12th through the 14th. I always learn a great deal at this thing. I've been going for three years now, and every time I come back inspired to get started on a project that's been rattling in my head. This year, my writing group and I volunteered to serve as customer service at the registration desk and in the pitch room—where you can pitch your story ideas to agents, editors, or publishers and see whether they're into them. We didn't get to go to many sessions, which is traditionally where I learn the most. This year, however, I hung out with a lot of people. I had an opportunity to sit and chat and drink with acclaimed novelist Steven James and Noah Ballard, an agent at Curtis Brown Ltd. They had a lot to say about the writing and editing processes that really helped me to put into focus what I want to do in my second draft of Stormborn: Thirteen Hearts to Start a Storm, Book One of my new series. The pitch room was pretty amazing, too. Noah Ballard and Dr. Uwe Stender, founder of Triada US, both talked to me and gave me insightful tips on getting my floundering novel Mister Kiefer to work. Thanks to them, I've been able to recapture the magic of starting that story. I had awesome talks with Christine Jarmola and Mari Farthing, both of whom were instrumental in my becoming the new webmaster for OWFI. Mari in particular has been tremendously awesome, and I'm pretty sure that she'd be fine if I started calling her my friend in public. It turns out that she and I have a lot in common, with one exception; she makes setting look easy. Her writing is nothing if not vivid and engaging. And who can forget Carol Johnson and Eric Reitan? I've known Carol for a while, and she's a deeply endearing person with a heart as large as a house. Eric is just cool. Apart from being a fellow writer, he also teaches philosophy at Oklahoma State University. He and I sat together and talked about Plato for a while. He, too, had ideas for a villain that exists in the Stormborn universe, though he doesn't present himself in the first book. I returned to Tulsa excited and overwhelmed by all of the socialization I did at the conference. I needed rest before getting back to work, and I didn't get any. I've been hard at work finishing Thirteen Hearts to Start a Storm so that I can begin editing it into a more viable second draft. Then I have to get to work on Mister Kiefer so that I can query a certain agent with it. When I have some time, I'll have to make some new additions to my Friends page. This is probably the hardest volunteer job I've had in awhile, and it requires much attention. I have become the official webmaster for OWFI, and I created its new website with a lot of coding that I hadn't expected to have to do. You never know what problems you're going to need to solve when you're building a website until you come across them. Fortunately, I had some help. Adrean, thanks for standing over my shoulder and telling me what's what. I needed that. Mari and I are working on a couple of things on the site, including making it interactive enough that users will want to visit it when there's not a major OWFI event looming. Like this writing contest. It was nice to see the majority of the work done. There's still a lot of little things left for me to do on the website, but I'm taking a short break to catch up on other things while people peruse the new content. I won three awards at the OWFI Writing Contest! My one first place award came in the science fiction/fantasy category for "Xinsheng," a story that was published in Dark and Dangerous Things III. According to the people who have read it so far, I should warn people not to eat before or while reading "Xinsheng." It's got elements of horror, ergo why it fit in the anthology wherein it was published. I also won an honorable mention for the poem "A Melancholy Gift" and second place for the novel Pyrrhic, which I'll be continuing to work on beginning in November, December, or January, as time allows. I gotta get a new Stormborn book out, after all. And my editor has me on deadlines that I must keep. I finally finished the first draft of Stormborn: Thirteen Hearts to Start a Storm. Yesterday. I've had this problem for a while where I get to within one or two chapters of finishing a story before I get stuck. It's not writer's block. More like writing anxiety. Or work-finishing anxiety. I'm a big procrastinator, and finishing things gives me tremendous anxiety—anxiety that only the threat of a looming deadline seems to push me past. But it's over. Now I get to think about other things while I edit this 32,000-word monstrosity. As I think about other things, Noah and Uwe both seemed to agree that Mister Kiefer would be better as a YA novel. I agreed with them both, and it's making the novel much easier to write. I spoke to Adrean about it, and I realized that I have to censor myself less when I write YA than when I write for adults. She suggested that it's probably because teens and young adults tend to be more OK with the expression of strong emotions. Adults are more reserved, and they tend to expect the same from others; whether the other is another adult or a child. I agreed with her, but I'm curious to hear what others think. I'm a counselor who works primarily with teenagers. Maybe I just relate to them more. I don't feel very mature myself, and being emotionally reserved feels like a little death is happening in my chest. I'm excited to write for this audience. Ultimately, I think I was really missing my target audience for that book, which is a huge problem. Knowing who I want to read my writing makes it easier to write for them. Mister Kiefer is definitely for people like its main character, Adam Al-Wali. Less for people like its eponymous character, James Kiefer. I'll probably post more about Mister Kiefer as time moves forward. Since it's such a big project—with a target date for querying of January 1, 2017—it only makes sense to pause every so often to blog about it. Last, but not least, Nevermore Edits and I are going to Oklahoma City to speak with the Oklahoma City Writers about writing nonconventional characters. I'm focusing my part of the talk on minority races and ethnicities in fiction because, honestly, we're not evenly represented in fiction. I found this out while writing "Xinsheng"; the main character, Alyssa Arreguin, is Chilean. But because her ethnicity isn't mentioned, people tended to assume that she was a White non-Hispanic. It's an important subject matter. In Stormborn: Thirteen Hearts to Start a Storm, a large number of the characters identify as gay or bi. The characters who are straight don't identify. At a critique group meeting, one person mentioned that it was "unrealistic" that such a large number of gays happened to exist in the same story—after all, only about 3% of the population identify as being lesbian, gay, bi, or trans. I didn't mention that in a heterosexist society, straight people don't tend to identify, and erasure of the bisexual identity means that bi characters tend to get lumped in as gay or straight depending on the gender of the person they're dating at the time. I didn't mention that 13.2% of my characters weren't Black and 17% of my characters weren't Hispanic. I didn't mention that 19% of my characters don't have a disability. I didn't mention that not a single one of my characters identified as Muslim. I didn't mention any of these things because we have rules, and authors aren't supposed to speak when their work is being critiqued. Fortunately, Shannon Iwanski came to the rescue with a scathing critique of our society, as well as of an editor who suggested that there was such a thing as "too many gays," which any reasonable person should find at least as offensive as someone pointing out that a story has "too many Blacks." I won't say anymore because this talk is gonna be awesome, and I want to try and record it for posterity. If I manage that, I might put it up on YouTube and embed the video here. See you all again later!